A hero never gets a day off. 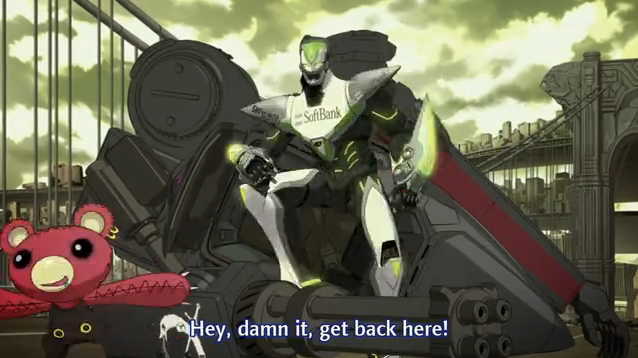 Episode 10 of Tiger & Bunny makes it clear that we are on track with at least one of the two main plot lines. Barnaby Brooks finds the man who killed his parents at last, but the necessities of a two course series keeps him from getting the answers he has longed for. To find out about this and other incredible (as in hard to believe) coincidences, read on. Kotetsu talking with his mom. The episode opening flowed well from last week, which dealt with parent child relationships. 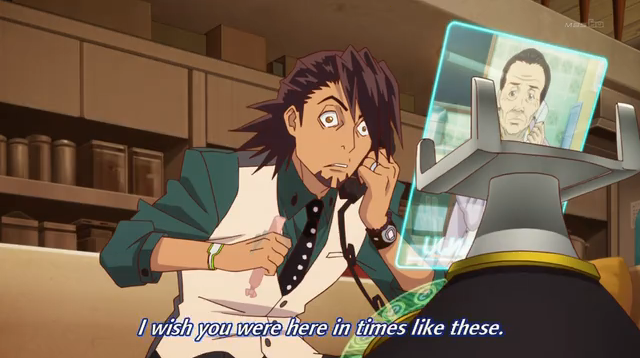 Kotetsu is having a chat via video-phone with his daughter. He is amazed with her skills at multiplication, though she probably learned the times tables five years before. She is irritated with the way he talks to her like a little child. In short he just doesn’t realize how much she has grown, probably because he spends so little time with her. Hush now, baby, don't shed a tear; papa's gonna buy you a teddy bear. It is here we begin a series of implausible coincidences. 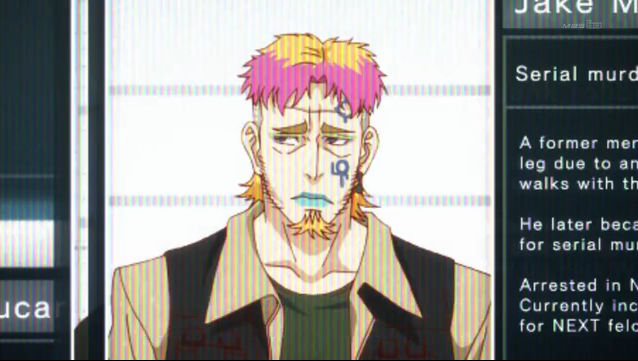 First his mother tells Kotetsu that his daughter is out of sorts because she lost her teddy bear. Just the thing to arouse his sense of her as a little kid, who can be given something precious by her adoring father. Kotetsu’s mom asks him to come out and spend some time with them, but he claims at first that he can’t because he can’t get the time off from work. Well (coincidence # 1), his boss tells him to take a vacation, so he goes to a toy store and buys a “Mad Bear” doll for his daughter. Blowing up bridges, and shooting people? That's not cute at all. As Kotetsu drives to see his kid, (coincidence #2) the bridge he is on is struck by a terrorist attack. He starts fighting the mecha-terrorists, only to find (coincidence #3) they are piloted by the “Mad Bear” dolls he just saw for the first time in his life. As similar terrorist attacks occur throughout the city, the heroes are split up, and sent to different locations to fight the coordinated threat. This leaves Wild Tiger alone and vulnerable. Wait! Alone? Where is Bunny-chan? Barnaby "Bunny" Brooks finally remembers the face of his parents' killer, and it looks like this. It just so happens (coincidence #4) that Barnaby remembers what his parents’ killer looks like and is speeding to the prison where he is being held. But, since (coincidence #5) he happens to see a newscast as he is driving that shows Wild Tiger is in a pinch, Bunny speeds to the rescue. The couple then have a nice battlefield chat, and take the time to look over some paperwork that Bunny brought in his battle-suit pocket, before declaring that they can go see this “Jake” character any time, seeing as how he is locked up in jail. At that point (coincidence #6) Ouroboros announce that the whole city is their hostage, and they will drown millions of people if Jake isn’t let out of jail immediately. About as subtle as getting hit in the head with a rock. Now I don’t want to give the impression that this episode was absolutely awful. There were some good points. I mentioned the continuation of Kotetsu’s parental dilemma. That was handled in a decent way. 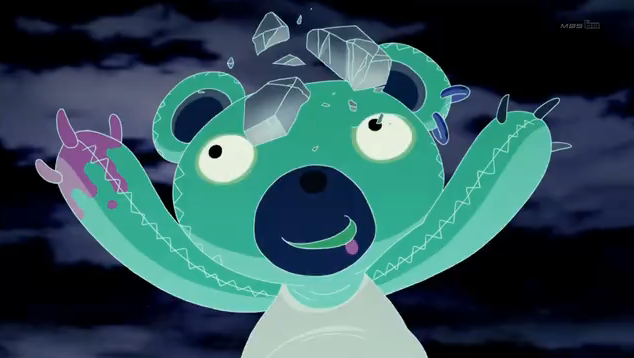 The way his desire to connect with his daughter was minipulated by the store clerk into buying the “Mad Bear” was a humorous take on the role of consumerism, and the back and forth with Kotetsu’s boss, who tells him to go on vacation when it is in the interest of the business, and then insists that heroes don’t get vacations when it is in the interest of the business, is also very fitting for the show. He's finally on the board! Only 2,984 points behind Sky High. I enjoyed seeing the other heroes in action, including Origami actually getting some points for saving an innocent, and Blue Rose and Dragon Kid squabbling. The idea of overwhelming the heroes with a coordinated terrorist attack was good, and I liked the fact that the mechanized assailants were being piloted by teddy bears under some sort of Next control. It is also good that we are dealing with at least one of the major plot lines. Ouroboros is now out of the shadows and we seem to have at least three Next villains to contend with (not including Lunatic). Agnes, where is your confidence now? I also liked the tension in the Hero TV control room. The dude in the groovy yellow shirt and afro tries to convince Agnes Joubert, the show’s producer, that people will panic if they see the heroes fail to stop the terrorist attacks, but she insists the broadcast should continue. It is only when he convinces her that it will be bad for the show if people lose faith in the heroes again, that she reconsiders. The owner overrides her, but the broadcast is eventually blocked by Ouroboros. This was about as good of an assessment of the ethics of broadcasting as we have gotten from this series. What is the role of the media? Should they strive for ratings even if it means creating panic in the citizenry? 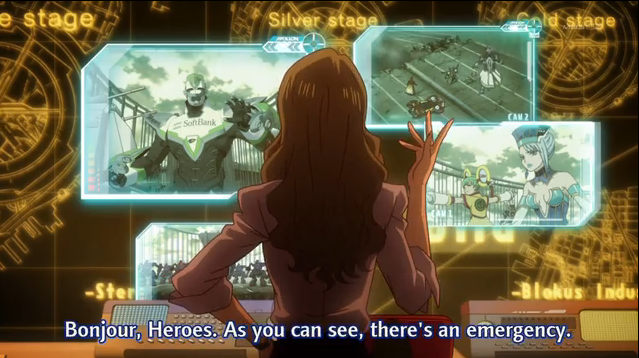 There are times when Tiger & Bunny tries to be more than a superhero action comedy. Even though it rarely acheives subtlety in those moments, I actually appreciate the attempt to inject some social commentary into the mix. Aside from that the show can be thrilling in its action sequences, and has a decent sense of humor, but the plot has not shown signs of cleverness. This wasn’t the first time this show relied on outrageous coincidences, but it did seem to be attempting a record for the most implausible coincidences squeezed into a single episode. There are no coincidences in this world. There is only hitsuzen. What I’m saying is, it’s all a conspiracy set up by their bosses! It all makes sense! Don’t you think those two bosses are somehow creepy? And that guy stopped them when they wanted to stop the broadcast… very suspicious. hitsuzen – Wow! You get bonus points for that one. 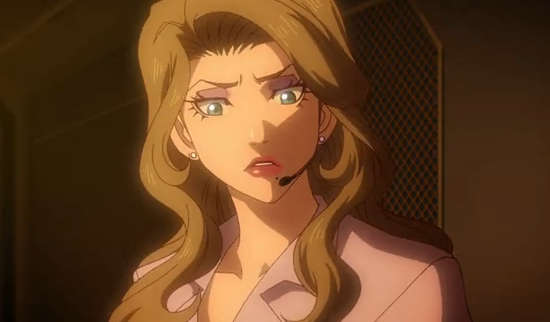 Yeah the boss that stepped kept the broadcast going was suspicious, and I have been wondering for a while if the show was a bit of a scam, where the show might have set up (or otherwise “encouraged”) the criminals that the heroes are fighting against. Still there is no solid evidence of that yet. Woah, if Leah-san is right then I’ll have to keep that in mind. 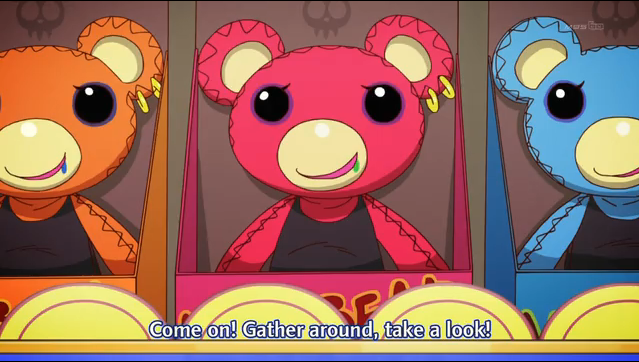 I thought it was weird that things were leading to one thing to another, but that mad bear is too obvious an allusion to gloomy bear oh dear. I like Kotetsu’s daughter complex, it’s so fun to watch! This was about as good of an assessment of the ethics of broadcasting as we have gotten from this series. What is the role of the media? Should they strive for ratings even if it means creating panic in the citizenry? I really can’t say much about the plot so far as there’s just so little to delve on right now. But the characters, the humor and the action do somewhat make up for it. I’m just wondering what direction T&B is heading. As long as it is a fun ride that looks good, I’ll be at least a little happy. It does have potential that it isn’t quite living up to, but, hey, there’s always something that could be just a bit better. There are a few more convenient plot devices here in this episode too. I mean, after 20+ years of staying hidden, Ourboros all of a sudden decides to declare war on an entire city? Why didn’t they do it years before? Also, Bunny coincidentally running into the prisoner’s profile right when he was going to turn off his computer is convenient as well. I guess all of this is supposed to go along with “suspension of disbelief”, but the stuff you’ve mention is jarringly noticable. Yeah, some of it I was going to give them a pass on (like Kotetsu says I’ll really be there this time about 20 seconds before he tells his daughter he won’t be able to make it after all), figuring it’s meant to be a joke, or whatever. The problem, I think, comes when you pack a LOT of it in one episode, and make key plot points depend on it. 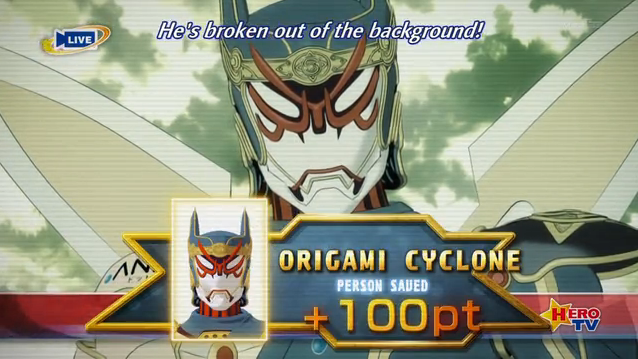 There goes my theory about the girl that Origami saved actually being Origami, she must be really unlucky to have to be saved episode after episode. That said from the preview I’m kind of worried about him, his ability finally comes in handy but at the same time it’s almost enough to raise a death flag. Jake has to escape. Anyway, I think there’s more than Kotetsu not being around enough that made Kaede snap like that. She can’t view him the same way we do and over the years she’s lost faith in him. However she still should have been able to hear the bomb go off on the bridge and I think that they should have at least been able to meet in person for once. Now that you think about it there really were a lot of glaring coincidences in this episode, it probably would have been less noticeable if some of them were paced out over two episodes but few of them really are hard to believe. Yeah, this wasn’t the best written episode. Maybe they tried to pull off too much in one episode, and that made some of it seem “forced” instead of natural. Oh well. Maybe they’ll redeem themselves next week.